Famine has been declared in South Sudan. 100,000 people face starvation and a further one million are at risk. Concern has 300 staff members already in position. Here’s how we’re responding — and how you can help. Famine has been declared in Unity state, where 100,000 face starvation. In Greater Unity, a further one million are on the brink of famine. Famine is the most serious and deadly stage of a hunger emergency. Over 4.9 million people in South Sudan — about 42% of the population — currently face the prospect of hunger. This is projected to rise to 5.5 million people by July at the height of the lean season, including over one million malnourished children. During the last four years South Sudan has been wracked by a brutal civil war that has killed hundreds of thousands, forced millions to flee their homes, and devastated its economy. Read more about the origins of the crisis here. Concern has a staff of 300 in South Sudan, reaching over 700,000 people. Concern has been working in Unity state since 2014. 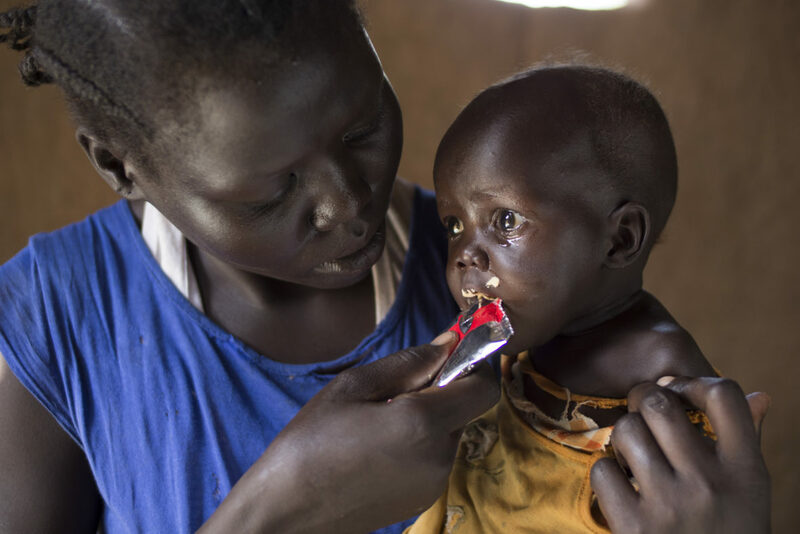 Our staff are responding to the extreme nutrition crisis there, mostly within the civilian protection site at Bentiu, as well as three other nutrition sites. We are currently providing clean water and latrines for more than 63,000 in Bentiu, and treatment for malnutrition to almost 10,000 women and children there and in surrounding areas. Aweng Ayii and her 10-month-old daughter, Adut Ayii Garang, at their home in Nyamel, Northern Bahr el Ghazal. When she was admitted to Concern’s outpatient therapeutic program, Adut was so severely malnourished that she weighed just 9.7lbs. The normal weight for her age should be between 15.5—22lbs. Aweng is feeding her ready-to-eat therapeutic food, supplied as part of the program. 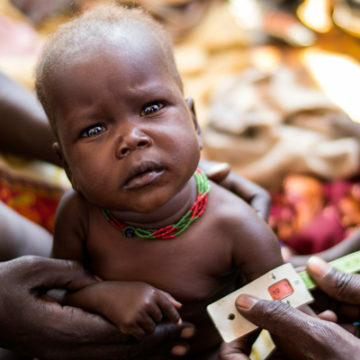 Malnutrition levels in Northern Bahr el Ghazal are at the highest since records began 15 years ago. We are scaling up our existing nutrition and health programming in response, and now run 48 nutrition sites. We’re operating quarterly food distributions to over 300,000 people to help prevent widespread malnutrition in the area. Concern teams also go family to family to screen children for malnutrition and provide treatment and referrals as needed. Concern is also working in the capital, Juba. We are working with the WFP to distribute food to over 2,400 displaced families and treating malnourished children in camps and in three primary health care units. Read more about how this crisis happened. 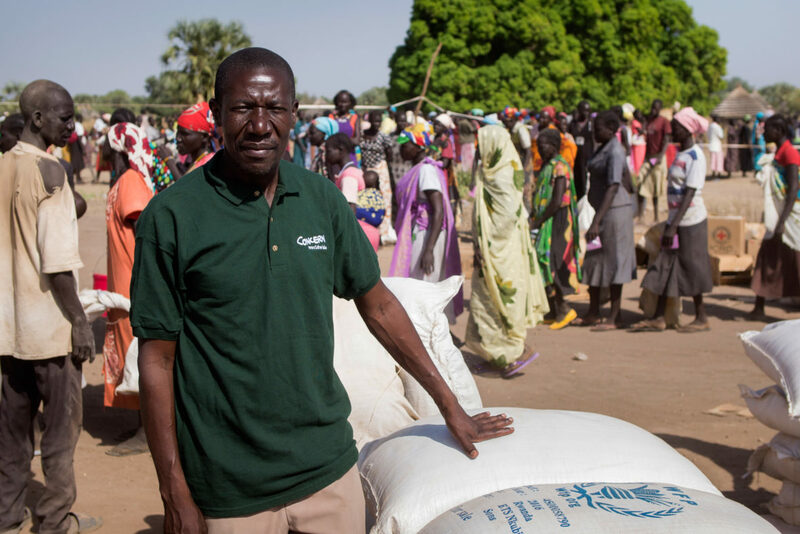 You can help families in South Sudan and other countries facing hunger.